The NUS, a confederation of 600 students’ unions amounting to more than 95 per cent of all higher and further education unions in the UK, supposedly represents the interests of more than seven million students nationwide: claiming to “promote, defend and extend the rights of students and develop and champion strong students’ unions”. But someone seems to have missed the memo. In other words, if you identify as a female student, transgender student, disabled student, a member of the LGBTQ+ community or Black student (a term which the NUS deems inclusive of Asian and Arab as well as African-Caribbean communities), you have the right to be represented and listened to. After all, all of the aforementioned categories have elected officers positions within the NUS, as well as in many university student unions. But evidently if you are a man- you do not have a right to be heard. Your male perspective is invalid: your emotions are not important; men’s issues are not important. You do not matter. According to The Independent, James Knight- the first elected Men’s Officer at UWE- insisted that the purpose of the role was to emphasise “the mental health issues facing male students”. But Lasoye remains unconvinced. Bizarrely, Lasoye acknowledged that there is room for “much-needed discussion on the influence of toxic masculinity and societal pressures faced by men” in her statement to the Independent, before appearing to renege on this sentiment in her twitter attack, blaming the idea on “an unearned sense of entitlement”. This is something James Knight denies, emphasising that “the necessity of a Men’s Officer [isn’t] surrounding male liberation at all”, meaning it is a separate issue that does not infringe on the rights of minority groups already represented and protected by various Liberation Officers (and rightly so). It should also be noted that what Lasoye deems “a fundamental misunderstanding of liberation” is in fact code for not compatible with the ideology of intersectional identity politics, which, as highlighted by Professor of Psychology at U of T Jordan Peterson, is a radical leftist movement that has become a hallmark of activism in higher educational institutions. Indeed, intersectional feminist theory is centered around a hierarchy of oppression and privilege: one’s position in this matrix is determined by race, gender and sexuality predominantly, as well as class. Such a model does not consider other important factors in the development of people as individuals, such as: quality of upbringing; education; relationship with parents; mental health and wealth, or even religion. Consequently, the individual is reduced to a mere label- lumped into arbitrary categories- sometimes with absurd results. This becomes more obvious when we take into account other factors besides race, gender and sexuality. For example a straight, white working class female, poorly educated and with a traumatic upbringing due to an alcoholic parent, would still be considered more “privileged” than a lesbian, middle class black female from a private school. This is because the formers “whiteness” and “heteronormativity” allegedly places her at the top of the sociopolitical ladder. This feels dehumanising, at best. 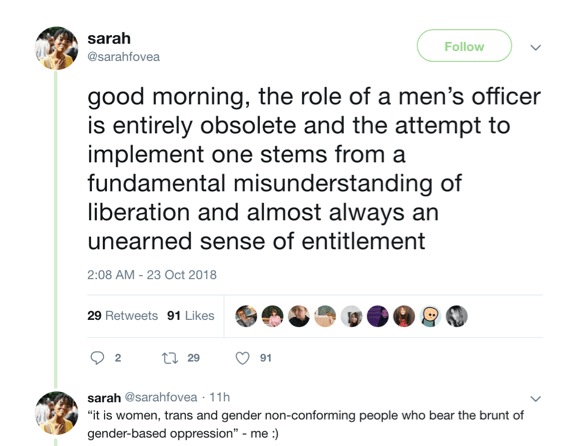 Likewise, given that “women, transgender and non-conforming people bear the brunt of gender based oppression” as highlighted by Lasoye in another tweet, men’s issues just don’t matter because men are deemed the oppressive group. Even if a small minority of men are responsible for injustice and suffering, all men are lumped together as bigots and oppressors. It is safe to say that this hierarchy and its obsession with race and sexuality, underlying resentment and Doublespeak, feels more like a manifesto for Orwellian dictatorship than it does a blueprint for a compassionate, coherent and multicultural society in the UK. Intersectionality paradoxically insists that white people and heterosexuals indefinitely have it better in than everyone else and in every way, but at the same time privileges the voices of the ‘under-privileged’ above everyone and at any cost. I don’t understand why it has suddenly become acceptable to determine the validity and worth of a human being by the colour of their skin and who they’re attracted to, which is something that Intersectionalists seem very comfortable with. Given the fact that males constitute just 44% of the national student population (according last years figures), as well as the fact that men are three times more likely to commit suicide in the UK, it seems very odd to me that a prominent and elected representative of the NUS, a national and inclusive organisation which claims to champion “equality of opportunity for everyone to participate fully in a society that celebrates diversity” can likewise assert that men’s voices are “obsolete” and “entitle[d]”. Sorry gents. If you’re looking for a safe space to discuss and explore your mental health, you won’t find it here. 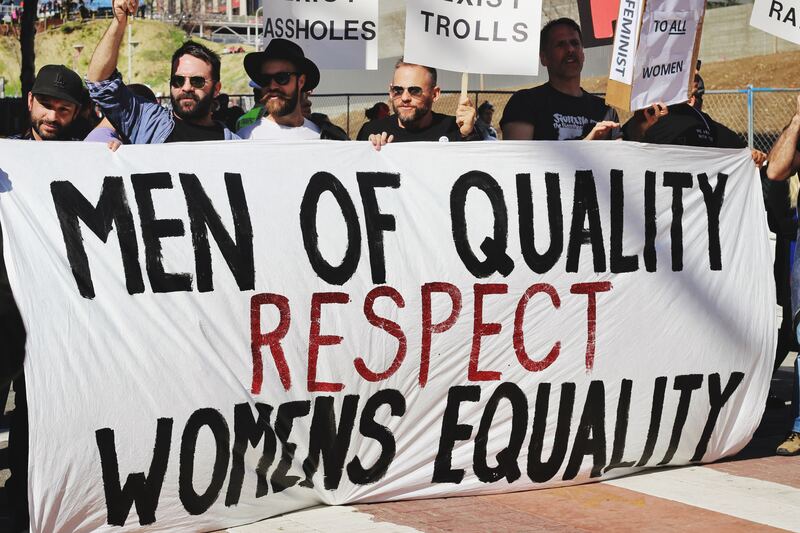 If people who identify as men are irrelevant and not even supposed to be listened to, how are we going to start the conversations that help us build a better world? So much for championing “Equality” “Democracy” and “Collectivism”.